The week started with The Broncos entertaining La Siesta Pioneers and played very well to take 5 rinks and the overall shots, a good result on a difficult day. As we know the losing rink can be just down to the luck of the rink and opponents draw. Meanwhile The Pintos were at Emerald Isle playing the Titans and although play was a mixed bag, though sufficient had a good day to enable us to come away with 2 rinks, never a bad away result. On Friday the Raiders had a bye. Whilst the Mustangs were at Country Bowls playing the Gheckos, the mat was playing unexpectedly narrow and fast whilst heavy with due, but slowed down rapidly and widened as it quickly dried. With several close run rinks the Mustangs came away with one rink and a draw, of course results can often be a result of rink and opponent draw as well as play. Judy Foley, Keith Cunningham and Geoff Jones 16-18. Barbara Jones, Sheila Cooper and Carolyn Harris 15-17. Ann Taylor, Malc Sykes and Jim Gracie 21-16. Irene Thomson, Jim Taylor and Eddie Thomson 12-21. June Whitworth, Jane Hamill and Stew Hamill 17-17. Bob Morgan, Merv Armstrong and David Whitworth 14-19. The Maples were away to Quesada Pearls on Monday, Final score was, Total shots 73- 127. Pts 0 – 14. In the Discovery Division the Sycamores were at home to La Siesta Apollos. Final scores were – 85- 134. Pts 2 – 12. 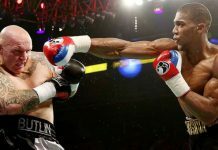 In the Fed Fours the Bulls were away to Quesada leopards. final score was 41 – 66. Pts 0 – 8. In the Discovery Division the Sycamores were at home to La Siesta Apollos. Final score was, 85- 134. Pts 2-12. Winning rink Jean Giddings, Phil Lockley, skip Graham Watt. 20 – 12. In Div C the Cedars were home to Montemar Toreadors. Final Scores – Total shots for – 116-109. Pts 12- 2 Winning rinks were – Rudy Wattley, Terry Lawton, skip John Obrien. 27 shots to 10. Heather Meston, Mary Lockley, skip Kim Hunter, – 19 shots to 17. Joan Hunter, Ron Stansfield, skip John Wray. 18 shots to 16, Vic Young, Margaret Hirst, skip Mike Cassidy. 22 shots to 9. Janet Bliss, Phil Lockley, Graham Watt. 21 shots to 19. Started well this week with both Monday teams winning. The Explorers were at home against Vistabella Drivers and won 8-6 in a very close game Four out of six rinks won or lost by two shots or less. One winning rink gave us the overall score that being Alex Whyte, Mike Surch and Janet Parsons Also winners were Peter Parsons, Phil Pape and Barbara Forshaw plus Jim Manning, Margaret McLaughlin and Hilary Cronk. 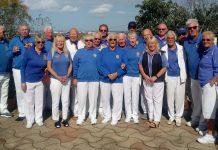 The Pathfinders did very well away against Country Bowls Flamingos winning on four rinks plus the overall shots to give them a 10-4 win. Steve Hindle, Angie Butler and Peter Bailey won 25-9 while John Withers, Martin Butler and Paul Tregoing had a very good 30-6 win. Don Harrison,Bernie Carr and Mo Taylor won 30-20 and Dave Taylor, “Captain of the Day” Dave McGaw and Lorita Rae won by one shot. Went to the Emerald Isle who are second in the Winter League and had a great game although we lost 9-3. John Mallet, Mike Stone, Roger Stacey and Anne Stone lost by one on the last end. Dave Hadaway, Carol Smith, Barbara Forshaw and Janet Parsons drew while Barry Latham, Peter Parsons, Wendy Latham and Kathy Manning won on the last end. The Berleen did themselves proud with a 26-12 win thanks to the sterling efforts of Alex Whyte, Jim Freeman, Mike Surch and Dave Bulfield. The Seagulls went over to La Siesta to play the Blues and came away very blue in the face losing 10-4. Perhaps they were missing someone. Tom Edwards, Peter Bailey and the wonderful Barbara Forshaw won and so did Dave Taylor, Gina Hindle and Lynne Armitage. Better news from the Sharks who had an 8-6 win over the Vistabella Picadors at home. Roy Hart, Peter Parsons and Andy Bartlett had a 23-13 win while Dave Lewis, Jim Manning and Margaret McLaughlin won by the same difference and Alan Castle, Phil Pape and Janet Parsons won by two shots more. The Dolphins were once again playing somewhere against Quesada Swifts and lost 10-4. The two winning rinks were Don Harrison, Reg Jackson and Lorita Rae with John Withers, Angie Butler and Shirley Withers winning 26-9. Well done them.ver. 22 – 15. David Field, Margaret Dewar, skip Marilyn Fryatt. 18 -15. Return to winning ways for the Apollos with a convincing 12-2 victory away to Greenlands Sycamores by 134 shots to 85.Top Rink was Irene Laverick with Pat and Brian Harman winning 25-8. The other winners were Dave Davies, Norman Adcroft and Vic Mahomet 29-17, Dawn and John Taylor with Harold Charleton 23-13.Barbara Cooper with Bill and Sue Jordan 22-8, and Beryl Styring, Irene Mangan and Alex Morrice 23-19. The Pioneers travelled to the notoriously fast El Rancho and only picked up 2 points losing by 123 shots to 93.However, many of the rinks were close encounters going down to the final end to decide the result. The winning rink for La Siesta came from Hilary Clarke, Molly Russell and Rab Logan who won 19-14. An in house encounter in the Fed 4’s with the Hoopoes and the Parakeets meeting. As in the first meeting between the teams it was the Parakeets who gained the bragging rights winning 6-2 and by 57 shots to 42. The Hoopoes winning rink was provided by Jack Cooper, Norman Adcroft with Tony and Val Dalton by 21 shots to 14. The Winter League team made the long trip to Javea Green with a depleted squad, due to a sickness bug and a car breakdown, and not surprisingly found the going tough. The single point in a 11-1 defeat was provided by Pat Harman, Mike Edwards with Trish and Pat Reilly in a 12-12 draw. The Blues entertained La Marina Seagulls and had a good 10-4 win by 142 shots to 99. The biggest win was for Dawn Taylor with Bill and Sue Jordan who won 45-4 whilst Dave Davies, John Taylor and Harold Charleton had a comfortable 24-11 victory. Closer wins for Jo Elkin, Pat Moore and Vic Mahomet 25-19 and Sue Mahomet, Trish and Pat Reilly who won 20-18. The Golds travelled to Emerald Isle to play the Roundheads and came away with a narrow victory by 99 shots to 92 taking 8 points to their opponents 6. 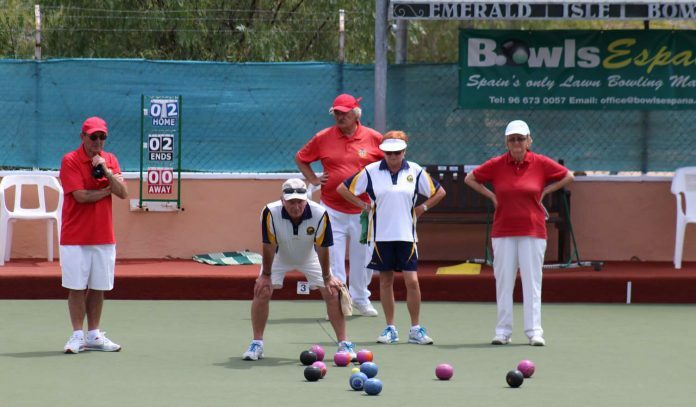 Biggest winning rink for the Golds was gained by Ron Sheldon, Val Dalton and John Clarke 29-9, whilst Hilary Clarke, Tom Heaslewood and Tony Dalton won 16-9 and Ken Stringfellow, Rod Edgerton and Tony Campbell had the narrowest of wins 16-14. Not a good day for the Toreadors as they were soundly beaten by the Neptunes. Well done to the team of Pauline Woodfine, Dave Thomas and skip Barrie Woodfine who saved the Toreadors from a complete whitewash by drawing. Shots Toreadors 70 – 147 Neptunes. Points Toreadors 1 – 13 Neptunes. Monday 13th February. Monte Mar Matadors v San Miguel Pulsars. Winning on just one rink well done to Denise Ashberry, Dave Melville and skip Bill Young. Shots Matadors 74 – 124 Pulsars. Points Matadors 2 – 12 Pulsars. Tuesday 14th February. Monte Mar Picadors v San Luis Bazas. Another good week for the Picadors winning on two rinks and drawing on one. Well done. Shots Picadors 53 – 41 Bazas. 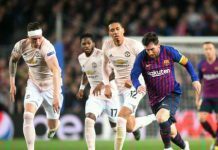 Points Picadors 7 – 1 Bazas. Wednesday 15th February. Winter League Monte Mar v San Luis. Winning on just one rink well done to Geraldine Fisher, Gordon Fisher, Joan Harding and skip Bill Young. Shots Monte Mar 64 – 77 San Luis. Points Monte Mar 2 – 12 San Luis. The Toreadors were up against Greenlands Cedars today, only managing to win on one rink. 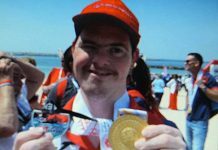 Well done to Jan Webster, Pauline Woodfine and skip Barrie Woodfine. Shots Toreadors 109 – 116 Cedars. Points Toreadors 2 – 12 Cedars. Monte Mar Matadors v Greenlands Oaks. Winning on two rinks, well done to Geraldine Fisher, Don Cleeter, skip Gordon Fisher 23 – 11. Pauline Merry, Val Hignett and skip Chris Merry 16 – 15. Shots matadors 98 – 109 Oaks. Points Matadors 4 – 10 Oakes. 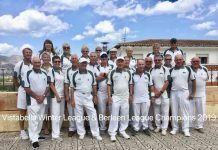 SAN LUIS BOWLS CLUB REPORT 17.02.17. A few more matches; with points & places still up for grabs! South Alicante Winter Triples: Enterprise Div. Monday 13th SL Klingons away v VB Albatrosses, some hard won points 8-6, 99 shots-110. Winners: Shirley Verity, Jo & Julian Pering 15-14, Bob White, Keith Phillips, Mal Hughes 17-16, Steve Simmons, Keith Roberts, Giuseppe Galelli 18-17, Kath Reid, Sabrina & Russell Marks 22-10. SL Trekkers, home v SM Meteors, a close result, 6pts-8, 95 shots-103. Winners: Irene Everett, Dave Tilley, Vic Slater 18-14, Ros Holmes, Marina Beardsall, Derrick Cooper 21-12, Margaret & Barry Roseveare, Neil Morrison 23-19. Discovery Div. SL Romulans, home v SM Comets; a tough day 2-12, shots 81-139. Winners: Bob Bromley, Tony Davies, Margaret Clarke 16-14. 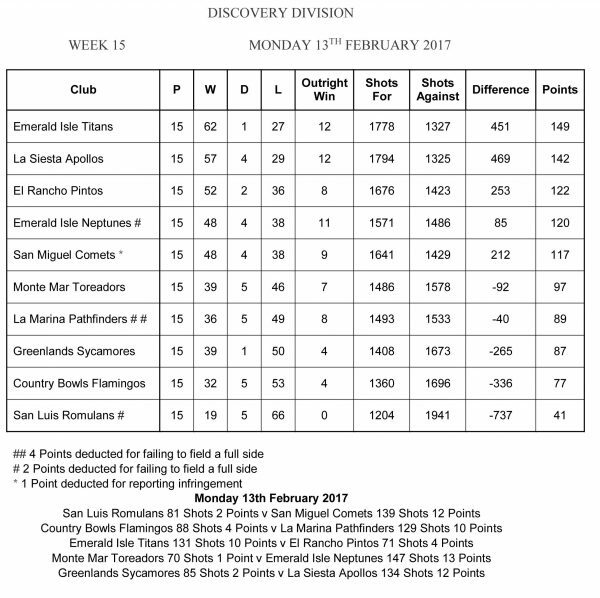 Winter League: Wednesday 15th great result away v Monte Mar; points 10-2, shots 87-64. Winners: Neil Morrison, Jo Pering, June & Keith Jones 21-11, Kath Reid, Sheila Cammack, David Blackie, Scott Malden 16-10, Irene Everett, Lynne Morris, Peter McEneany Tom Hill 22-12, Ann Holland, Keith Phillips, Sabrina Marks, Mal Hughes 14-11. No Berleen match this week. FED 4’s League Div A SL Ospreys, Thursday 16th home v EI Leprechauns, a good result with a very close finish; 48shots-43, pts 6-2. Winners: Shirley Verity, Jo Pering, Giuseppe Galelli, Russ Marks 18-12, Pam Lockett, Ann Holland, Ray Pollock, Tom Hill 18-16. Div B SL Condors; good points home v CB Badgers, 6pts-2, shots 57-41. Winners: Margaret Morrison, Ray Clarke, Charlie Marigold, Neil Morrison 20-15, Mags Haines, Bill Webb, Barry Edwards, Colin Potter 28-9. 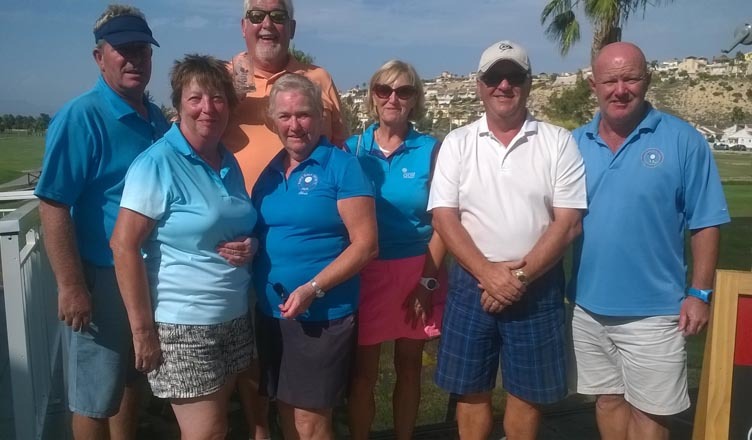 Tuesday 14th Div C SL Bazas away v MM Picadors, a tough game 1-7, 41 shots-53, well done Pat Bird, Kath Waywell, Bob Bromley, Graham Bird 14-14. Friday 17th LLB Southern League, SL Lions were away at Mazarron. It was a long journey for a disappointing result, shots 71-137, 2pts-12. Winners: Kath Reid, Keith Phillips, Scott Malden 19-11. SL Tigers, home v EI Cavaliers had a good result 9 points-5shots 105-83. Winners: Mags Haines, Dave Tilley, Vic Slater 26-4, Cas Blay, Barry Edwards, Ray Robson 17-17, Marina Beardsall, Bill Webb, Neil Morrison 20-11, Margaret Morrison, Colin Potter, Peter Fuller 16-12. SL Pumas away v VB Conquistadores, a close result 6pts-8, 90 shots-99. Winners: Chris Phillips, Tom Fromson, Derek Smith 19-15, Pat Baylis Danny McErlean, Phil Hasler 20-11, Chris Lythe, Tony Davies, Margaret Clarke 17-12. 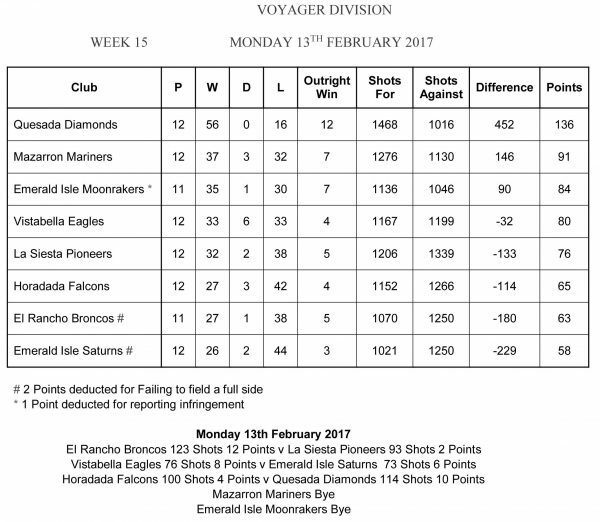 Some brilliant results this week, In the SABA league San Miguel Comets beat San Luis Romulans 12-2, with a shot difference of 139-81.Superb bowling by Stan North, Joe Getgood, Jack Jackson 27-7: Bob Nesbitt, Dave Champion, Barbara Scotthern 21-15: Bob Hanton, Frank Scotthern Bob Donnelly 38-9: Ann Eagle, Jim Jarvie, Mike Bayfield 18-16; Meg Brownlee, Carl Eagle 21-18. The Pulsars also won 12-2, with a good shot difference 124-74. Very well done to Ron Squires, Keith Green, Alan Campbell 21-11: Paul Hayward, Tom Dalgliesh, Derek Farmer 26-7; Pete Masters, Brenda Rees, John Staden 22-13: Anita Brown, Sheila Booth, Gary Raby 24-13; Peter Rees, Ken Hope, John Raby 25-12. The Meteors also beat San Luis Trekkers 8 points to 6, with shots 103 for, 95 against. Val & Chris Collier, Stuart Denholm 19-14; Noel Davis, Dave & Lynn Greenland 27-7; Margaret Patterson, Brian Miller, Cliff Plaisted 22-12. 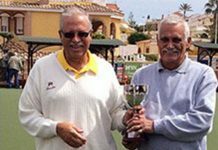 The Winter League had a great result away at Finca Guila winning on all rinks. 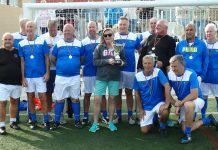 Well done to Margaret, Lee, Len, Steve 18-15; Alan P, Brian A, Brian M, Lin 24-10; Cliff, Val, Chris, Stuart D 22-20; Jan, Noel, Don, Stuart H 18-12; Carol, Mick, Dave, Lynn 20-11. Shots for 102, against 68. In the Fed Fours The Apaches played San Miguel Cherokees, the Cherokees winning 2 rinks and overall shots and the Apaches won on 1 rink. For the Cherokees winners were Cliff Plaisted, Reg Cooper, Stuart Hemmings, Steve Cantley 20-12; Carol Rudge, Brian Miller, Len Rudge, Lin Miller 16-14 and for the Apaches Paul Hayward, Jim Jarvie, Ron Nairey, David McEwan 19-18. Shots, Cherokees 54, Apaches 45. Another great result for the Jaguars beating Emerald Isle Claymores 12-2, with overall shots 112 to 87. Well played by Pat McEwan, Alan Booth, Dave McEwan 25-12; Ken Hope, Sheila Booth, Gary Raby 17-10; Sue Milner, Derek Farmer, Alan Campbell 18-14; Jan Farmer, Ron Nairey, Paul Thomas 18-12; Anita Brown, Tom Dalgliesh, John Marshall 17-15. YES The Jaguars are now top of the league!! 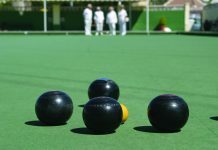 For further details on San Miguel Bowls Club, please contact the President, Eileen Potts on telephone 966730376 or Secretary Pat McEwan telephone 966714257. Winter league away at Bonalba. A fantastic result across the board! L Bishop, P Tomkins, A Brown & I Kenyon 32-9. J Chaplin, M Foulcer, B Norris & E Bishop 27-7. B Regan, C Watkins, S Allman & B Dunn 22-13. S Burrows, B Brown, M Regan & G Thorpe 18-7. O Ratcliffe, J Bowman, C Thorpe & B Pain 19-15. Shots 118 (12) – 51 (0) Bonalba. Bonalba won the Berleen. S.A Enterprise league. 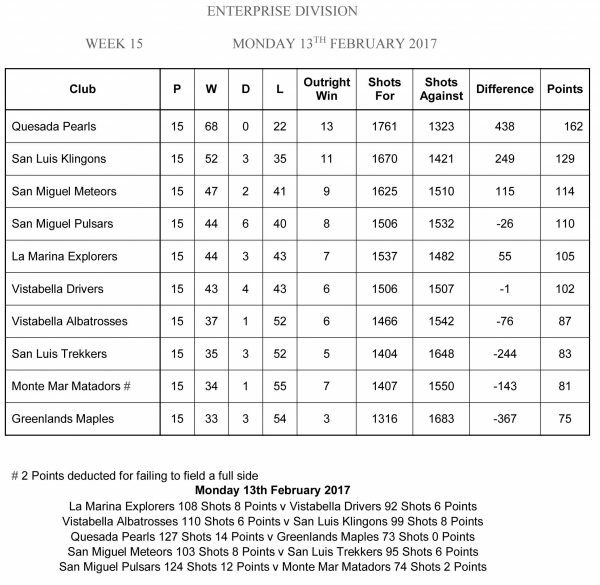 Some very close games this week , the Albatrosses at home to San Luis Klingons had three rinks losing by one shot, very unlucky! But two good wins from G Paylor, S Allman & E Bishop 31-13 and T French, C Watkins B Pain 22-14. Shots, V B 110 (6) – 99 (8) SL. The Drivers away to La Marina Explorers also lost a couple of games by one shot but had three wins from P Rafferty, B Pointon & C Thorpe 20-18. F Barclay, L Barber & G Thorpe 20-19 and J Chaplin, S Norris & I Kenyon 16-15. Shots VB 92 (6) – 108 (8) LM. Voyager league Eagles got their feathers wet in a sudden downpour playing at home against the Emerald Isle Saturns, they won the game after twelve ends played, M Irwin, R Hudson & D Stevenson 24-4. R Savage, K Savage & D Hudson 16-10. D Graham, P Tomkins & J Harwood 11-9. Shots VB 76 (8) – 73 (6) EI. Fed 4’s. The Vikings were away to Quesada Panthers getting a good mauling! Shots, 31 (0) – 64 (8) Q. Southern league Lanzadores away to Quesada Swallows, some dismal results this week, best forgotten! J Chaplin, S Broadhurst & I Kenyon 18-15 & L Bishop, C Watkins & A Brown 15-15. Shots VB 70 (3) – 151 (11) Q.
Picadors away to La Marina Sharks, three wins from F Barclay, B Ewart & G Thorpe 24-16. K Hardy, S and B Norris 20-12. D and A Leggatt & C Thorpe 18-16. 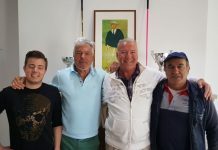 Shots VB 99 (6)-113 (8) L M.
Conquistadores home to San Luis Pumas also won three Rinks, S Cox, R Hudson & J Harwood 32-11. M Irwin, J Bagwell & M Cox 16-12. R Smith, P Cadwell & D Hudson 13-11. Shots VB 99- 90 (6) LS.